Discussion in 'GameMaker Studio 2 Community Tech Support' started by YoKoNo, Feb 7, 2019. So I have a parent obj which I have a child from, In the child events I accidentally created a new event which overwrites the parents events. 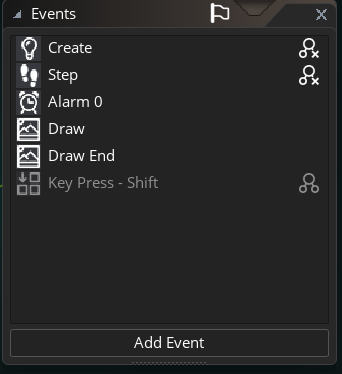 I know I can use the function event_inherited(); in the code editor, but is there a way I can just undo the action? ctrl-z has no effect. Just delete the event in the child. so it wont appear as greyed out but will still be pulled from the parent? Once you delete the event in the child you should see the same event greyed out which signifies that it exists in the parent (and will be run unless otherwise specified). In the image below the Key Press event doesn't exist on the child object and so will be called in the parent object, the rest will be called on the child object unless event_inherited() is specifically called.